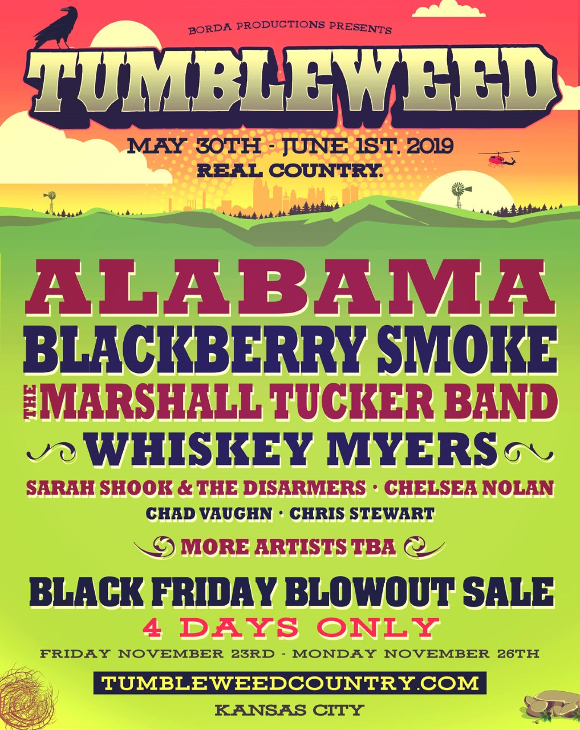 The Tumbleweed Music Festival set to take place just outside of Kansas City May 30th through June 1st has just announced their initial lineup of headliners, and it appears the 2019 installment will have a strong Southern rock flavor to it. Included in the initial release of names is Country Music Hall of Famers Alabama, Southern rock legends The Marshall Tucker Band, along with Southern rock present-day mainstays Blackberry Smoke and Whiskey Myers. If nothing else, the 2019 Tumbleweed Music Festival will be LOUD. Also announced as part of the initial lineup is surging, Bloodshot Records-signed country outfit Sarah Shook and the Disarmers, along with Chelsea Nolan, Chad Vaughan, and Chris Stewart. This is just the first major announcement of acts playing the 2019 festival, with many more names, including a healthy dose of up-and-comers Tumbleweed annually gives a shot on their festival lineup coming soon. 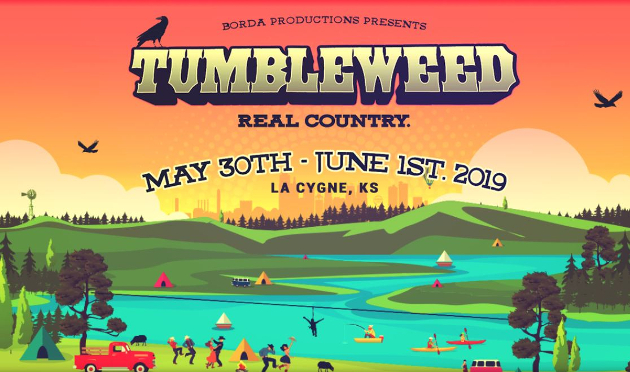 The Tumbleweed Music Festival takes place in La Cynge, Kansas, just a short drive out of Kansas City in the 2,600 acre La Cygne (“Lay-Seen”), and offers canoe trips, fishing, archery, fully equipped cabins, forest camping, and VIP experiences as part of the festival. Tumbleweed is also the only major festival in the United States that offers free tickets to all veterans, active duty military, first responders, and 911 operators who register for the festival before November 12th. For more information and to purchase tickets, visit tumbleweedcountry.com . Beautiful lineup, amazing festival! Appreciate the support from Saving Country Music. I’m impressed that they offer the free tickets to our nations finest. Alabama? They were a shell of themselves when I saw them on their farewell tour in 2004. What a lineup! This will be my first year attending. Can’t wait. There will be about 30 acts over two stages when it’s all said and done. They have real country and Americana acts so fans of scm will not be disappointed. I’ll be there! Awesome headliners at an awesome event!